A powerful novel set in Gallipoli, that’s part war-story and part mystery. It is 1915 and Thomas Clare rues the day he and his best friend Snow went to war to solve the murder of his father. The only clues – a hidden wartime document and the imprint of an army boot on the victim’s face – have led the pair from the safety of Queensland to the blood-soaked hills of Gallipoli. Now not only are Thomas’s enemies on every side – from the Turkish troops bearing down on the Anzac lines, to the cold-blooded killer in his own trench – but as far away as London and Berlin. For, unbeknown to Thomas, the path to murder began thirteen years earlier in Africa with the execution of Breaker Morant – and a secret that could change the course of history . . . 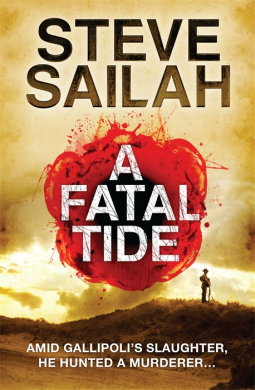 The scope of this novel is quite ambitious: its themes include the Australian soldiers at Gallipoli in 1915; the Boer War, particularly what led up to the execution of Breaker Morant; the relationships between Aborigines and whites in Australia in the early twentieth century; as well as a closely plotted murder mystery. The novel also falls in with a pattern emerging in Australian fiction as the 100th anniversary of the Gallipoli landing approaches, of novels set in the First World War that wrap fictitious plots in historical fact. Real historical characters such as Major General Harry Chauvel and Lord Kitchener make an appearance.It also explores what it was like at Anzac Cove and the role that trench warfare played there even before it became the dominant feature of the Western Front. I did find parts of the murder plot a bit far fetched, particularly the idea that the murder of his father led Thomas Clare to enlist, and indeed the reason why his father was murdered. Nevertheless the plot holds together fairly well and the background to the main story certainly added to my understanding of the times. There seemed to be some unresolved strings at the end which could well be the platform into a sequel. from Gallipoli, was republished in April 2013.